Well, no baby news yet, but I do have a quilt to show you — it’s always a great feeling to finish a quilt! No matter how many I make, I always look forward to pulling a new one from the dryer. 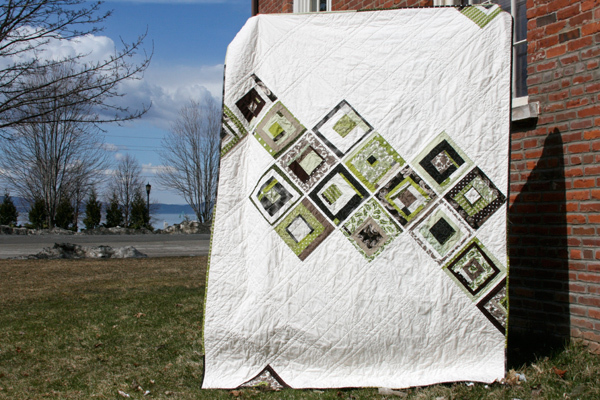 I put off quilting this one for a while since it’s on the larger size (and I was feeling too large to attempt it!). But I finally decided to go for it, and I’m so glad I did – it’s fun to have this one finished! It’s made up of Denyse Schmidt Greenfield Hill fabrics in the Dogwood palette, along with some Japanese polka dots, some Erin Michael Lush, a bit of Cake Rock Beach and a couple Essex solids. I made up a bunch of these blocks (which you can see here and here) and then decided to play a bit with the layout, setting the blocks on point and scattering them through the center of this quilt, amidst a sea of Kona Snow. On the back, I used up most of the leftover printed fabrics to create this stacked strip, bordered on either side with more Kona Snow. 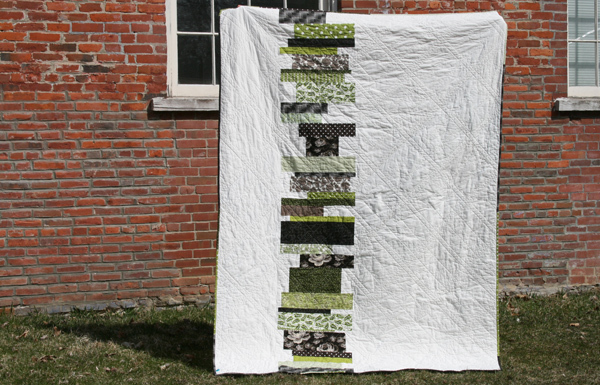 I’ve always loved the look of stacked and staggered blocks, and it’s always been on my list to make a quilt top in this manner. Perhaps looking at this backing will motivate me to finally do that! I quilted this one with straight lines, echoing the square blocks – quilting on either side of the narrow sashing. I was hoping to leave it like that, but there was too much space between the quilting lines so I filled in with some additional straight lines through each block. And actually, I like it better like this, so I’m glad it turned out that way. I made up a scrappy binding using the remaining fabrics, and I love how it looks. Typically I’m more of a solid binding kind of girl, but since there was so much white space around the edges of this quilt, I thought scrappy and printed might work well and I’m pretty pleased with the look! Definitely looking forward to spending some time on the couch with this one! 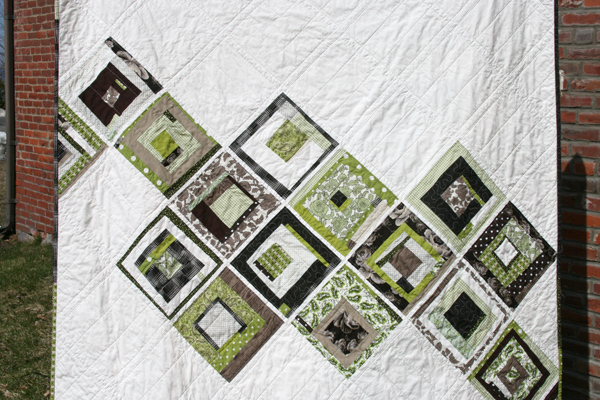 This entry was posted in [search] Square-in-Square Quilts, [search] Wonky/Improv Quilts, Posts about Quilts, Quilts and tagged blocks on point, denyse schmidt, greenfield hill, handmade, improv, improv blocks, kona snow, lush, quilt, quilting, wonky. Bookmark the permalink. I love how you use every bit of fabric to finish your quilts but they don’t look hodge podge. I have to say that you are my biggest inspiration. 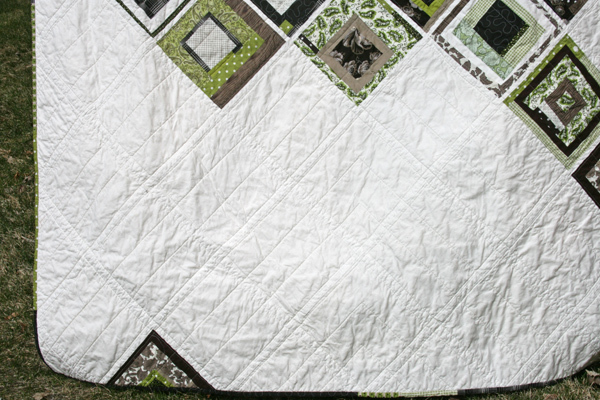 I recently started a new quilt with a wonky log cabin style and lots of white space. This quilt just gave me the confidence to finish it. Love it! Here’s hoping for a baby this week! your work is amazing! you totally inspire me!! Where are you getting this energy from!? I want some, and I’m not pregnant! Even at this stage you are inspiring us in so many ways. Many of us remember just lying around during the final days or weeks. Not you. You reward us every few days with something new and wonderful to gaze at. Thank you. Now, please put your feet up. a work of art. 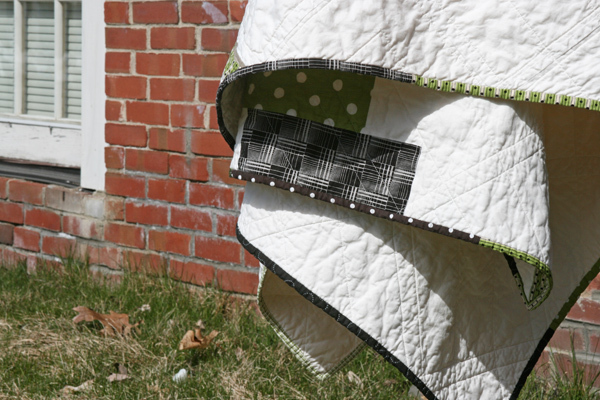 love the quilting that visually echoes your design. niiiiiiice. I love these blocks so much more now that I see how you laid them out on point. 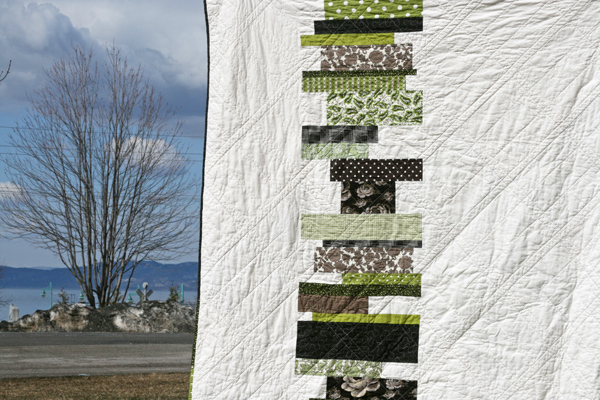 I love the randomness of this quilt, and the reversibility with those cool stacked coins on the back too. Very well designed! Good for you! One to enjoy looking at in the coming weeks. I haven’t been a fan of the Greenfield line even after people said they liked it so much better in person, but honestly, I love what you did with it. It’s like it’s just enough of it to show off how good it can be, but not so much in your face that your overwhelmed. Great job!! And I love the quilting too. Just gorgeous! You did a really beautiful job 🙂 And I’m amazed you did all that with the baby belly in the way! I love your quilting style. It is always refreshing and has inspired me to start up again. And I can’t believe that you’re getting so much done at 40+ weeks. Amazing! Qt for you.. do you prefer washing your fabrics before quilting? Thanks! I’m still not feeling the Greenfield Hill (even after seeing it in person) other than a couple of the very simple prints, but I LOVE THIS QUILT!! Wonderful!!! Hope that little baby boy in there shows his adorable (an easy assumption to make!) face soooooon!! Lovely colours. Perfect for this part of spring (in the UK at least) where all the leaves are just unfurling out of their buds. Bring on Summer! This is great. I love the back as much as the front! I love it! I loved the snowy photos of the top and the finished quilt looks amazing. Lovely Ashley! I still haven’t decided what to do with any of my GFH. I love these blocks on point. Now go take a nap under it, baby will be here any minute! Love this! I’ll admit, I haven’t loved the Greenfield Hill line so much, but I love the subtle greens and grays against that sea of white. The scrappy binding and those couple of half-blocks at the edges are really stellar. I LOVE love love this! I think My Mr might even go for patchwork like this! The stacking and seemingly random pattern remind me of Scrap booking and I love the triangle! This inspires me to try making a quilt! I love your quilt! It love how it’s so different on the front and back but everything matches so well. Great job! I LOVE the colors!!! Great job! Yep, waiting for baby news here! 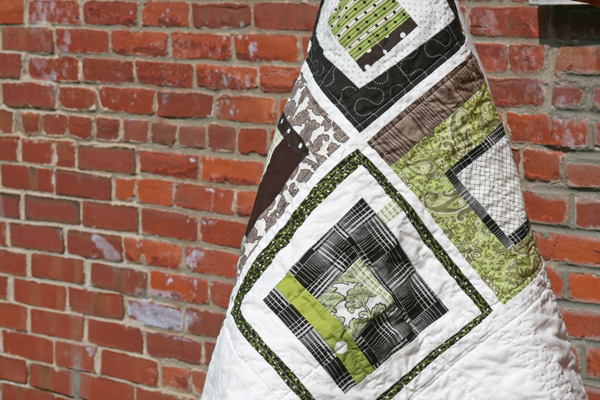 Your quilt is beautiful — either side could be the front. Can’t wait to see you wrapped in it on the couch with a baby in your arms. That is so sweet. I love it too. Those are some of my very favorite colors! As I learned from my first baby of three, they just want to stay in a little longer…hang in there and rest lots! you will need it for the labor – and then your sweet new little man will be here sooner than you can blink! Can’t wait to meet him! Now, go REST. Hugs! Hi Ashley, NO BABY YET??? You need to let that little guy know that he’ll be very comfortable wrapped in warm quilties upon his arrival. Glad you’re keeping busy. You make me feel like I want to sew everyday! Love it! You are so creative with your use of fabrics, I’m inspired every time I visit your site! And I can’t wait to read the post about your darling baby’s arrival! Wishing you and your family all the best! cool geometry as usual….. never, never would have thought of that smashing combo. I just love the back, when you get a chance I would love a tutorial on that. Although with your baby just around the corner time is something you will not want to give away lightly. I had my first baby 9 months ago and life is very different now – wonderful but different. Thanks for the inspiration. Might I recommend a great kids singing book? The Singing Day by Candy Verney. I was singing with my three boys today, and I thought you might like it too. It comes with a CD. I listened to the CD a number of times before I learned the words myself. But once I went back to the book after having listened to it, I found I “knew” the songs. It’s a good way to learn. Anyway… a little random thought. Love the simple but artistic approach in this quilt. Is there a formula or “pattern” you follow for these blocks or is it what ever scrap is next? I love this quilt. For what it’s worth, my son does too. He was impressed (at age 12) with the square set on point and all the white space. Someday I’m going to need to copy the concept, right after I make a string quilt and a few others you have made. What I really want to know is, am I the only one checking here daily, not just to see what new quilt you’ve sewed, but to see your new baby? Ha, Christine! You are not alone!! I’m thinking (hoping!) this posting gap means we’ll get to see the baby soon! Hope your baby arrives soon! Those last few days of waiting are trying! I need to re-visit that warm fuzzy feeling of finishing a quilt. It’s been awhile! Ha! Hope that baby is sleeping in the fabulous nursery soon! ha ha ha – that’s supposed to say YOU are so amazingly talented and fabulous…just thought you should be told again. I really really like this quilt. The front AND the back are lovely! Christine, you’re certainly not the only one checking daily to see the baby!! I am here every day. 🙂 just can’t wait to find out. still waiting on baby news. I’m checking daily as well. Come on baby! I just LOVE this….stunning!! <3 Absolutely stunning!